Ever wonder how air compressors work? Not specifically your air compressor, but how all air compressors are supposed to work, in general? Taking a moment to read this page will help you understand how air compressors are supposed to work, and will help you figure out what is wrong with your air compressor when yours doesn’t. Everyone thinks air compressors compress air. That is true. But also, the air compressor is an energy converter. The DIY type air compressor you have in your home, garage or small workshop takes in electricity as a power source, and converts that electricity into compressed air energy. Compressed air energy is stored in your compressors air tank, and waits, ready to use, until you plug the air line into an air tool. Then ‘bam’, that stored compressed air energy flows out of the tank, down the air line, and goes to work for you via your air tool. As long as you have sufficient air pressure in the compressor tank, your air tool will continue doing work for you without using any more electrical power. When an air compressor motor starts, it begins to operate the compressor pump and that compressor pump sends air into the air compressor tank. The compressor tank on your air compressor tank might be the size and shape of the one in the photo, or your compressor tank may be a pancake style or a stacked tube style. Regardless, when the pump starts pumping, air should flow from the pump into the air tank on your compressor. The air compressor motor starts either because the compressor is on and you are using compressed air, and the air pressure in the tank falls below the pressure switch cut in pressure setting of your air compressor, or, you just turned your air compressor on (assuming yours has an ON/OFF switch or you just plugged it in if it doesn’t) and the air pressure in the tank is below the cut in pressure level. Quick Tip: If you turn the compressor on or plug it in and nothing happens, look at the pressure gauge on the tank. If that pressure reading is above the pressure level where your compressor normally starts, then your compressor will not start. Make sure you are looking at the compressor tank gauge and not the regulator gauge. This next photo is of a typical pump on a smaller air compressor. You can usually identify the pump as it is made of metal, and has exposed metal fins. Sometimes these fins are on the side of the pump, some times on the top, and often both. The purpose of these fins is heat dissipation. Compressed air generates a lot of heat, and the fins are adding surface area to the metal of the pump, and this increased surface area allows faster heat transfer from the metal to the surrounding air. The small air compressor manufacturers sometimes shroud their air compressor pumps and motors entirely inside a plastic cover. This, I guess, makes them look better, at least from the manufacturer’s perspective. My thoughts are thus. If you cover the pump up, you are reducing the speed with which the heat build up can be transferred to the surrounding air. Too much heat is bad for almost any electro-mechanical device. I think shrouding the pump on any air compressor is the wrong approach. But, back to how air compressors work. So far we’ve talked about the compressor tank that stores the compressed air, and we’ve talked briefly about the pump that sends the air into the tank. Your pump may or may not look like the one in the photo but if you have a compressor, then you have a pump of some kind on it. When the air pressure in your air compressor tank falls below a certain level, the air compressor should come on to rebuild the pressure in the tank. The device that turns the air compressor on and off is the pressure switch. Depending on your make of air compressor, the pressure switch on yours might be one like the Condor in this photo. The Condor make has an internal unloader valve. Your compressor switch might also be a Lefoo type (or other Chinese made comparable switch), with an external unloader valve. What unloader valves are and what they do on your air compressor will be linked from air compressor equipment on the navigation bar at the top of the page. Both of the Condor and the Lefoo type of compressor pressure switches are normally located on the discharge pipe from the air compressor tank. If yours is a mini-compressor, you may not even be able to see your pressure switch, as it could be inside the housing. Regardless of the type of pressure switch you have, they all work in a similar fashion. The pressure switch on your air compressor will arrive with factory preset pressure set points. One of those pressure switch set points will the the cut in pressure setting. This is the lower pressure set point. When the air pressure in the compressor tank drops to this set point, the points inside the pressure switch close, electricity flows through the switch to the motor circuit, the motor turns on and starts driving the pump, and the pump starts sending air down into the compressor tank. For more on how air compressors work please follow this link. If you have a comment or question about how air compressors work, please use the comment box below. We have a small air compressor we use with our heat press. It takes a very long time for it to fill. What can you recommend we check to fix this problem? Please have a look, and add a comment if this isn’t enough information. This is a FS-Curtis (CA10) 10-HP 80-Gallon Ultra Two-Stage Air Compressor (230V 3-Phase). I am sorry, I do not know what the switch you refer to is. Please clarify. My compressor is an older one. It fills to around 450kpa cuts out, then cuts in at around 350kpa. The plate on the tank says the wp is 920kpa. the cut in and out on the pressure switch says 300kpa and 1100kpa. Not sure if that makes sense but I think there’s something not right. Assuming that the power supply is good and there is no mechanical issue, we would look first to checking the capacitors, and then getting the motor checked out next. I have a Craftsman 4 gallon, 1hp, dual tank compressor. On start up I have full pressure on whatever tool / accessory I use…..then 20 seconds later the pressure dips dramatically. It is almost as if the pressure in the tank is not being drawn on after the initial burst of compression. Is this a pressure switch problem or a valve problem? How do I fix this? I had to rent an air compressor for a job a little while ago. Although it did the job great, I was curious as to how it worked. I liked your article, it helped me a lot. The quick tip you mentioned about turning on the compressor happened to me, it wouldn’t turn on so I needed to call for someone to help. Anyway, thanks for sharing the information! My airbrushes run at 20-30psi and I have a 0.75hp compressor with 8gal tank. Default cut in 85psi and cut off 115psi. Will there be any benefit to set the cut in pressure lower for e.g. cut in 50psi and cut off 80psi? Is lower cut off psi means tank is only partial and not fully filled? Thanks. My compressor runs for 2 minutes get filled and cut off. Can i add a 25 gallon tank to my 5 gallon tank in other to power my tools? After a cold spell and not being used for about 6 weeks my compressor would not start. After warming up it will start for about 1 or 2 seconds and then slow down as if motor does not have enough power to turn compressor and does not turn fast enough to operate compressor. It will come completely to a stop if I let run. Bill, that sounds like a power problem, and based on your comments if this were our compressor we would be checking the start / run capacitor. See how to do that on that page on this site. Afterwards, if that helps, please let us know, and if not, let us know that too and someone will come up with plan B. We see another post has come through that may refer to this one. If so, would you please post it again here as a reply so we have some continuity? Thank you. You changed the capacitor. Obviously, when you tested it, it failed? Else why change it. So you have solved one problem. With the tank empty and the power off, remove the line to the tank check valve and make sure it’s working properly. Thanks for sharing this! It is cool to see exactly how air compressors work, especially since I will be getting one soon. It would be nice to know enough about them to be able to diagnose a problem when it stops working. 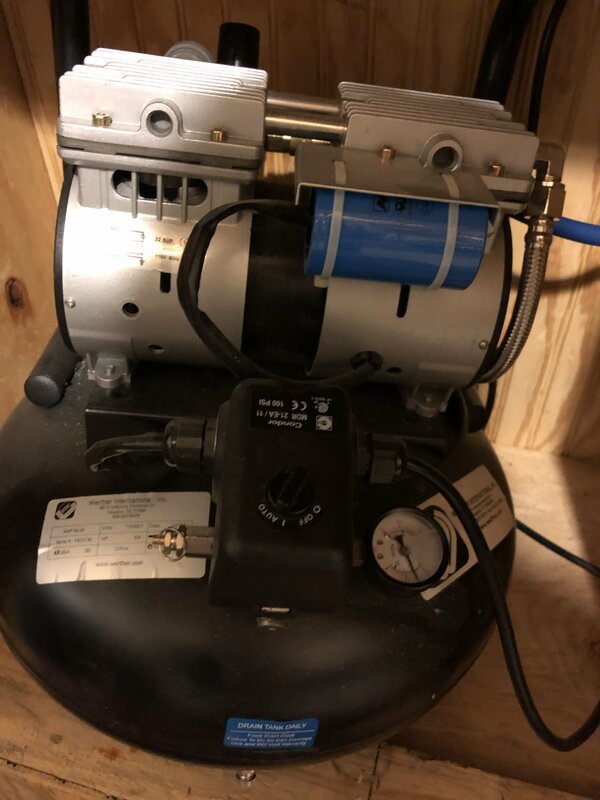 Any advice for a first time compressor owner? Hi Delores. Thanks for your kind comments. This site is here to help all air compressor users and any folks in the industry too, if it can. So, please feel free to offer constructive comments on any of the pages on this site, and also feel free to show in your post your email address and the URL of your company’s website too, if you wish. We welcome all useful contributions. Cheers. This is a great “how things work” article. I had no idea that the air compressor is actually converting energy. I realize, like you said, that it compressed air, but I never thought about it from an energy perspective. Very difficult to offer advice Peter when we have no idea what make or model of air compressor you have. Please provide that information, and, as well, upload a photo of the location on the compressor where the problem gasket is.